Finding the North Magnetic Pole is no easy task. The first person to reach the elusive pole was James Clark Ross in 1831. When his uncles ship became trapped in ice off the northwest coast of Boothia Peninsula, Ross took magnetic measurements and found the pole. Roald Amundsen headed to the Arctic 70 years later to set up a temporary magnetic observatory to relocate the pole. In the century since, only a handful of others have made it to the North Magnetic Pole. Even now, tracking its movement is a challenge. In May 2001, Larry Newitt of the Canadian Geological Survey and his French and Canadian team took the challenge. It was Newitts fourth time since 1974 flying in a Twin Otter plane from Resolute Bay to the frozen Arctic Ocean to survey the North Magnetic Pole. It was geophysicist Mioara Mandeas first, and the first time a woman had ever joined the expedition. We have really a very short window to do these measurements, she explains. In the remote Canadian Arctic, the sun must be shining. The ocean must still be frozen, allowing the team to land on the ice. And the day should be geomagnetically quiet, with few solar storms. The pole moves a lot in a normal day. So if there are some external disturbances, or magnetic storms, its really much more difficult to catch it, says Mandea of the Institut de Physique du Globe de Paris. While solar activity creates daily changes in the poles position, the main source of Earths magnetic field lies within its convecting liquid iron core. Activity from the outer core creates variations on longer time scales  so called secular variation that causes the pole to move slowly across the Arctic. The team measured the declination  the angle between true geographic north and magnetic north  and the inclination, or angle between the horizontal and the direction of Earths magnetic field, as well as the total field intensity. And the pole is the spot where the inclination is, in the case of the magnetic field, pointing straight down. We cant ever really hope to observe at the exact location of the pole, so we surround it and then use all the observations to eventually interpolate it, Newitt says. They located the North Magnetic Pole about 966 kilometers from the geographic North Pole. The expedition, Newitt says, was routine, but they did see a large acceleration over the last decade in the poles movement. Its moving at about 40 kilometers per year and roughly northwest. If it keeps going in that direction for another 50 years or so, itll end up off the coast of Siberia, he says. 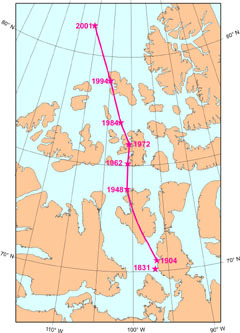 Newitt and his colleagues last surveyed the pole in 1994, and noticed an acceleration. They decided to return in 1998, six years earlier than when they would usually head back. But inclement weather prevented the team from landing. The following year, they were only able to make a few observations. But in 2001, they made it, completing a survey three years in the making. And sure enough, the pole has really taken off over that interval of time. Prior to the 1994 survey, it had been going at around 10 kilometers per year. We had noticed it speeding up to about 15 in 1994 and now its at around 40, Newitt says. Why it has sped up so much, researchers still do not know. But Newitt and Mandea both believe the changes are linked to sudden changes in the secular variation of Earths magnetic field. Also called geomagnetic jerks, these sudden increases in the magnetic fields intensity occur over periods of time lasting from months to a year or two. Mandea says that in the last century, researchers have recorded four jerks of global extent  in 1969, 1978, 1992 and 1999/2000. You see all these very clearly in the data from the Resolute Bay Magnetic Observatory. And each time that one of these jerks occurs, the change in the magnetic field at Resolute gets faster. And so I believe that the acceleration of the magnetic pole is most likely related to a series of geomagnetic jerks, Newitt says. Geomagnetic jerks and the movement of the North Magnetic Pole both originate from changes in Earths fluid outer core. We think that they are linked with the motion in the outer core, but there is no physical explanation for this observation, Mandea says. Indeed, the current scientific understanding of processes at the core-mantle boundary is a tenuous one. We are not really able to track the movements of the poles to sufficient resolution in time to distinguish individual events such as geomagnetic jerks, partly because of the hostile environment for making observations and partly because models of the Earths magnetic field have difficulty in resolving jerks, says Susan Macmillan of the British Geological Survey. She says that many researchers place too much significance on the magnetic poles for determining what is happening in the fluid core. Mandea is working to establish a quantitative connection between the poles movement and the geomagnetic jerks. In a paper published in last months Nature, Mandea and colleagues used MAGSAT and ORSTED satellite data for 1980 and 2000 to describe changes in the magnetic field at a global scale. And its very clear that in the Northern Arctic theres a very high secular variation and its nearly the same in the region centered on southern Africa, but very different in the Pacific area. She believes this may be the key to understanding the connection. In the meantime, though, Mandea says the survey is an important part of drawing declination maps for navigators and scientists who study geomagnetism. An international team of scientists produces geomagnetic models and maps. And while the poles position is not directly involved, its good information to verify that our models are good enough at the very high latitudes, she says.